Planet Aid Provides Coats in Rochester for Hurricane Victims - Planet Aid, Inc. This past Saturday, November 18, Planet Aid teamed up with Rochester, New York's Ibero-American Action League, MVP Health Care, and many other local organizations and volunteers to provide coats and other assistance to those in need. The area recently received an influx of Puerto Rican refugees, who fled their island after the devastation of Hurricane Maria. “This is a poverty stricken area, and this event is very helpful,” said Hilda Rosario Escher, the President and CEO of Ibero. “If it wasn’t for Planet Aid, we wouldn’t be able to have the event. 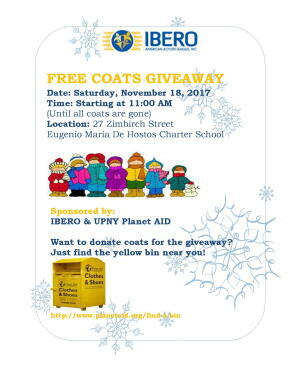 It’s very much needed.” Planet Aid gave away more than 1,000 coats this year to those who came to the Ibero event; it is the fourth year that Planet Aid has provided such support to Ibero. Prior to Maria, Rochester already had one of the largest Puerto Rican communities in the continental United States, with the 2015 U.S. Census estimate at more than 28,000. That number is higher today. Angelica Perez-Delgado, one of the event organizers, said that Ibero has helped more than 1,000 newly relocated families since the hurricane struck in September. Many of those new families were present at the coat give-away on Saturday. Planet Aid has an operations center in Rochester, and has been long been serving the greater Rochester and Syracuse communities by collecting used clothing and other textiles. Rochester residents line up waiting for the coat giveaway to start. Ibero President and CEO, Hilda Rosario Escher, speaks with an attendee about her family's needs. Event beneficiaries search through the hundreds of donated coats to find the perfect one for them. Volunteers dish out a traditional Puerto Rican meal to a family attending the event. Event attendees enjoy their meal before picking out a new coat.